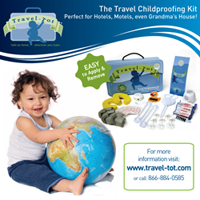 Travel trays are a great tool for keeping your little adventurer occupied while in transit; keeping toys, writing utensils, and food easily accessible and safe from dropping on the ground or out of reach! There are trays for all price points and ages, so do some research and snap one up before your next family trip! Destination: Out on a Limb! Safety Gear We Love for On-The-Go! Blogs We Love: Pint Size Pilot!